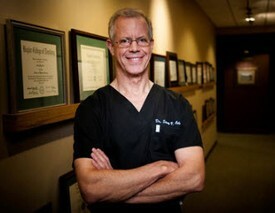 Born in Abilene, Texas Dr. Cole spent his elementary school years in the west Texas town of Snyder. His family moved to Fort Worth, Texas when he was in the sixth grade. Other than college at Baylor University in Waco, National Guard active duty in Fort Knox, Kentucky and Baylor College of Dentistry in Dallas, he has lived in Fort Worth ever since. Dr. Cole's wife and partner since 1975, Pat B., also a Baylor graduate, works in the office as a massage therapist, seeing patients who need relief from head and neck pain. She is trained in cranio-sacral techniques as well as many other modalities. The Cole's have had the great joy to see their two children, Audrey and South, grow up into extraordinary young adults. They feel blessed by their presence in Fort Worth and even more so with four dear grandchildren. Dr. and Mrs. Cole attend Christ Chapel Bible Church in Fort Worth where they are active in a community group and Bible studies. Dr. Cole promotes a culture of continual improvement, both professionally and personally. He is passionate about reading, studying and attending workshops to continually learn more about natural healthcare and new technologies. Dr. Cole is active in the holistic healthcare scene and frequently speaks to groups in the community about dental awareness from the holistic perspective. Dr. Cole practices what he preaches! His favorite hobby is training with kettle bells to stay fit, and as often as possible run on the Trinity River trails that meander throughout Fort Worth. His favorite leisure pastime is watching Baylor Bear football from the home game sidelines as team dentist, and providing care for Baylor University athletes from various sports. Dr. Cole genuinely enjoys life! Professionally, he is a member of the American Dental Association and Texas Dental Associations and he is active in the Fort Worth District Dental Society. He is a Fellow of the Academy of General Dentistry, a Fellow and board member of the American Academy of Craniofacial Pain, a Diplomat of the American Academy of Pain Management and he has been Board Certified as a Naturopathic Physician. Dr. Cole has over 3,500 credit hours of continuing education and continues to learn, teach, write articles and pursue innovative ways to address difficult cases with optimum aesthetics and health.